When talking about mini kegs and the problems encountered by beer drinkers, there are two distinct discussions necessary. One is the commercially produced mini kegs now offered by many commercial and even micro-breweries. The other requiring discussion is the in the home brewing field, of which there are untold numbers. The biggest problem seemingly shared by both is carbonation but there are other problems, particularly for home brewers. There is an amazing number of beer resources available at bookstores, local libraries and on the Internet. The most current information is largely anecdotal and found on blogs, both commercial and private, because of the relatively recent introduction of mini kegs. Mini kegs can range in both physical size (short and squat to elongated and tall), to the amounts of beer they contain. Most commercial mini kegs come in 1.33 gallon sizes. Because of the uneven results reported on both commercial and private blogs, it's difficult to determine how much of the problem is production based and how much is user based. Many beer aficionados report that they have not experienced problem with either leakage or over-carbonation while others complain of leakage in the dispensing system and over-carbonation. The largest number of complaints of the commercially-produced mini kegs refer to over-carbonation, particularly when discussing Heineken brand mini kegs (perhaps it's because there are the most popular and widely purchased, that's difficult to determine). Few have reported problems with dispensing leakage. It's difficult to say definitively whether the over-carbonation is due to jostling from transport or a sufficient amount of time the mini keg may need to settle before dispensing. 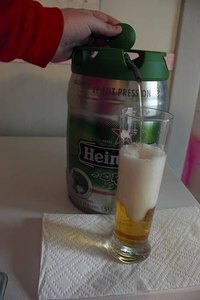 Most reports relate to pouring one-to-several glasses of mostly foam before getting a pub-style pour of a nice head and drinkable beer. Home brewing introduces many more variables and uncertainties than commercially brewed beer. While commercial beer has many checks and balances along the way to insure a uniform product, home brewing has basically just one--the home-brewer himself. The uneven results can start from the beginning of the process with inadequate sanitation to over-cooking the wert to introducing yeast while the wert is too hot, thus killing the yeast and preventing fermentation. Some home brewers report increasing the sugars during the secondary fermentation to increase the carbonation produced little difference and yet others have found that the increased sugars in the secondary fermentation have produced satisfactory results. It's difficult to troubleshoot with all the varied methodologies and equipment that are particular to each home brewer. At minimum it's safe to say at its present state, the results of using a mini keg are uneven in home brewing while bottling the same batch of beer has produced satisfactory results. Commercially, the cost per draft is about the same as you would expect at your local pub. Depending on the pub and taxes and overhead and how upscale the establishment, the cost may work out to be less than buying the beer by the bottle because it is slightly cheaper for the commercial brewery to produce and sell beer in larger containers than it is by the bottle or by the case. (Hence the cheaper cost per draft of buying beer by the keg.) For the home brewer, expect to pay $8--$10 for the mini kegs themselves, which is about on par with the cost of bottling because of the extra equipment. In the end, it's pretty much a wash. The advantage to home brewers is the time savings in filling a larger container rather than sanitizing bottles, caps and use of capping equipment. One can only imagine that commercial brewers will respond with better techniques to satisfy their customers. Over time, the results are likely to become more consistent. For home brewers there are three options, each with its benefits and drawbacks. There is the tried and true bottling method but it requires more time and effort. There is the option of using commercial soda dispensers, which work very well, but the initial investment can be costly. That cost, however, when amortized over the useful life of metal soda canisters, becomes minimal. The third option is to continue experimenting with mini kegs because the problem may be more one of methodology in brewing using an unfamiliar format than in the components themselves.